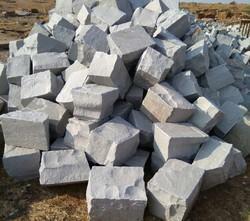 We are leading manufacturer, supplier and exporter of Indian landscaping stones. 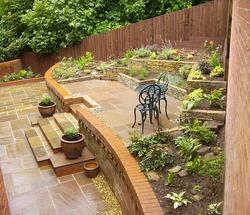 These all landscaping stones including Kerb Stone, Walling Stone, Paving Tiles, Cobbles, Planters, Stone Benches, Garden Steps, Block-steps, Garden Steps, Palisades, coping stones etc. All the landscaping stone we are manufacturing are available at wholesale prices and customized sizes and finishes. Landscaping stones are highly demanded in landscaping projects like Resorts, Eco-friendly housing projects, Villas, Hotels, Gardens etc. We are leading manufacter and supplier of Kandla Grey Garden Steps. we offer these steps with natural surface and hand chisselled edges. These solid steps are also known as sandstone blocksteps in world market and highly demanded for landscapings in gardens. We are manufacturer and supplier of Solid Steps for Garden. Unlike wooden, stone is more durable and hard, which have made it a widely acclaimed material for steps. It is more commonly used on slopes having thin soil, which easily get eroded and this prevents soil erosion. 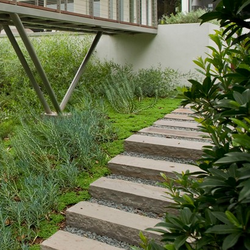 It provides a feel of calm and stability to any landscape design. They are frost resistant and non-slippery. We are leading manufacturer and supplier of solid steps for Natural Stone Solid Steps for Garden. Solid steps are also available in Grey, Brown, Green, and chocolate sandstone.These solid steps gives natural look in garden.Solid steps are highly demanded for landscaping projects. Finish Flamed, Sandblasted, Rough hammered, Bush hammeredetc. We are leading manufacturer and supplier of Cobblestone Paving Stone. Cobblestones were largely replaced by quarried granite setts in the nineteenth century. The word cobblestone is often wrongly used to describe such treatment. Setts were relatively even and roughly rectangular stones that were laid in regular patterns. They gave a smoother ride for carts than cobbles, although in heavily used sections, such as in yards and the like, the usual practice was to replace the setts by parallel granite slabs set apart by the standard axle length of the time. Cobblestoned and setted streets gradually gave way to macadam roads, and later to tarmac, and finally to asphalt concrete at the beginning of the 20th century. However, cobble­stones are often retained in historic areas, even for streets with modern vehicular traffic. Many older villages and cities in Europe are still paved with cobblestones or pitched. In recent decades, cobblestones have become a popular material for paving newly pedestrianised streets in Europe. In this case, the noisy nature of the surface is an advantage as pedestrians can hear approaching vehicles. The visual cues of the cobblestones also clarify that the area is more than just a normal street.The use of cobblestones/setts is also considered to be a more "upmarket" roadway solution, having been described as "unique and artistic" compared to the normal asphalt road environment. 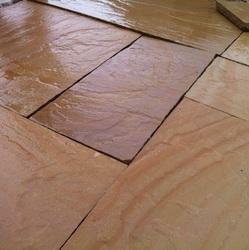 These are the Aravali Yellow sandstone Garden Sandstone Slabs. We are leading manufacturer and supplier of Garden Paving slabs from rajasthan, India. Garden Paving slabs are available in with various colors and finishes. Garden paving slabs are available in Kandla grey Sandstone Garden paving slabs, Autumn Brown Sandstone Garden paving slabs, Chocolate sandstone Garden paving slabs, Buff Sandstone Garden paving slabs, Raj Blend Sandstone Garden paving slabs etc. 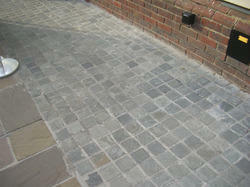 Garden Paving Slabs are available with Natural handcut Finish and calibrated. We offer customised sizes and finished according to the customer's desire. We are leading manufacturer and supplier of Stone Tiles for Outdoor Flooring. We offer best quality of sandstone tiles for Outdoor Flooring. We are leading manufacturer and supplier of Sandstone Block. These are kandla grey sandstone block. These sandstone blocks are highly demanded for pavement, wall construction are landscaping projects by landscapers and architects for garden. We provide the installation facility for sandstone blocks supplied by us. We are leading manufacturer and supplier of Sandstone Benches for Garden from Rajasthan, India. We sandstone benches with customised sizes and finishes. Sandstone Benches are available at wholesale prices for bulk quantity orders. Sandstone Benches are highly demanded by architects and landscapers for Outdoor seating areas. 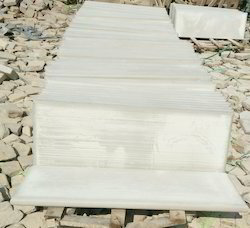 We are manufacturer and supplier of Natural Stone Steps for Stair. 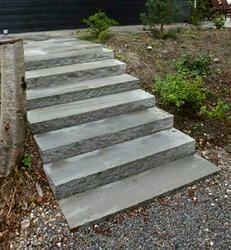 We supply kandla grey sandstone steps for stair could be use for internal and external stairs.